It's time for another update on the current state of supply and demand for homes in Tallahassee, and this month brings a positive shift as we mentioned in our last Weekly Special Report. The number of new listings entering the market is much less this year than it was last year, all the while the number of buyers is rising. This means that we should be seeing a nice dent taken out of the glut of homes for sale which has stifled appreciation over the past 8+ years. We've been scouring the data looking for the positive signals much of the rest of the US has seen, and this report is one that brings much hope for recovery. 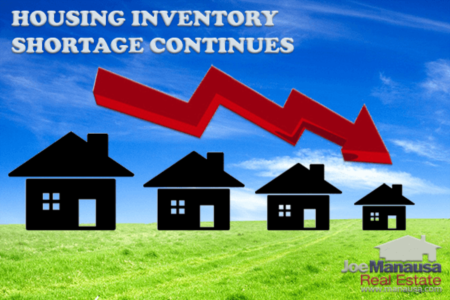 So sit back and check out a positive report on supply and demand in the Tallahassee real estate market, it has been a long time coming. Every month we look at the following real estate graph in order to see how the relative supply of homes (the amount of homes for sale in Tallahassee, relative to the current rate of demand, expressed as "months of supply"). While there is a lot going on in this graph, it is much simpler to understand than it might appear at first blush. The thin blue line is the information that we want to know ... the average months of supply (relative supply) of homes for sale in Tallahassee. This blue line is measured on the left vertical axis and shows that the inventory has dropped below 7 months of supply for the first time in more than 8 years. The gold band that runs across the graph shows market equilibrium, the level when supply and demand are in balance. When our thin blue line falls above the gold band, we say that it is a buyer's market. When it goes below the gold band, we call it a seller's market. Currently, the market has been trending away from a lop-sided buyer's market and moving towards a balanced market. I have been creating the following report for several years, and have always made it available for free, easy download from the Tallahassee Real Estate Website. You can click on this link to download the report that shows supply and demand for homes by area and price range in Tallahassee. This type of information of general information on the market should help you get a feel for the value of the home you own (or the one that you want to buy). If you would like a specific valuation, simply drop me a note and we'll schedule a time to evaluate your home and generate a top-notch report for you. 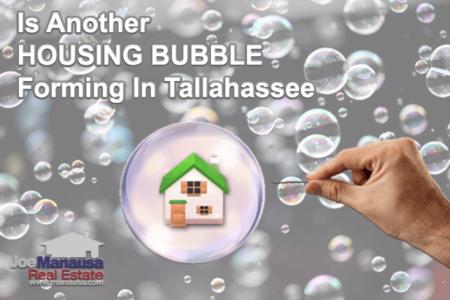 Is Another HOUSING BUBBLE Forming In Tallahassee?